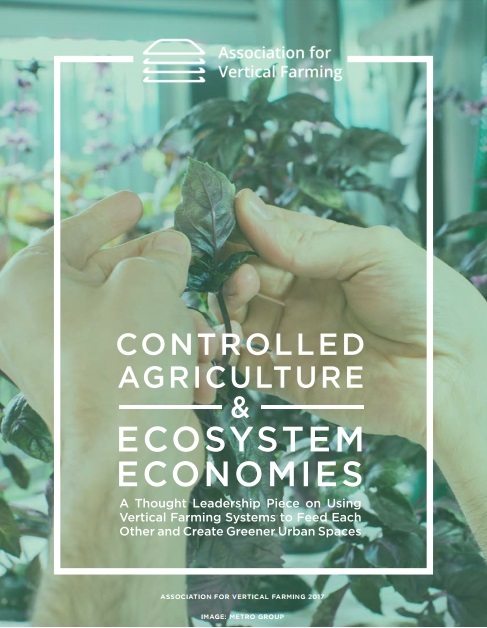 After months of work and collaboration, AVFami (Aquaponics, Mushrooms & Insects) has developed an exciting new white paper talking about how to re-imagine the way we think about vertical farming. Instead of viewing each organism as a marketable product in a linear system, we encourage you to begin considering an ecosystem approach: looking at how the inputs and outputs of every organism can compliment each other, including insects and mushrooms. In thinking about our systems this way we can both reduce our carbon footprints and reduce those of the communities around us. Please, read the white paper (see link below) to get a better understanding of this concept and use it as a catalyst for conversations to come! Thank you. 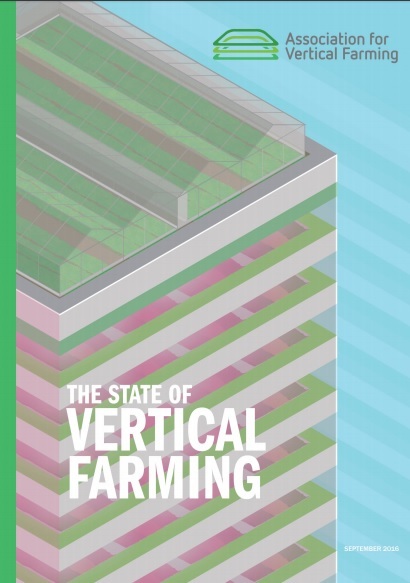 The Association of Vertical Farming (AVF) is pleased to announce the publication of Vertical Farm 2.0: Designing an Economically Feasible Vertical Farm – A combined European Endeavor for Sustainable Urban Agriculture – an attempt to ask bold questions and find serious answers in the fledgling sector of an emerging industry. 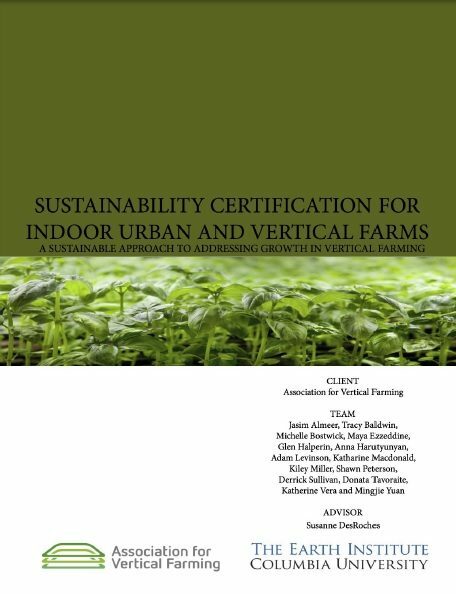 With contributions from Architecture & Food, Association of Vertical Farming (AVF), Blue Planet Consulting, CERTHON, Germain Aerospace Center (DLR), Dreyfus Farm, HAS Hogeschool, Heliospectra and RIJK ZWAAN. This white paper report was initiated by the AVF and then developed by all the participants over the course of the last two years. Thomas Zoellner, Co-Chair of the AVF Research Division concluded the report by reviewing the objectives and offering opinions to propose an open discussion on the subject and encourage further investigations. 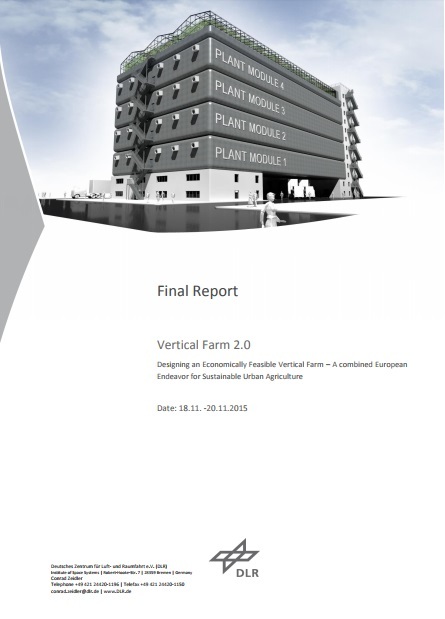 The Vertical Farm 2.0 (VF 2.0) report is the result of a Concurrent Engineering (CE) workshop held at the German Aerospace Center (DLR) in Bremen in conjunction with the Association for Vertical Farming (AVF). This workshop brought experts from throughout the world to lend their experience and knowledge in a collaborative manner. The baseline scenario developed for the VF 2.0 involves modular levels specialized for either leafy greens production or vine crop production. The final synopsis discussed is a facility which consists of a total of five modules; two of these modules are dedicated to leafy greens and two modules to vine crop production. All the while, the ground floor is a dedicated processing level which deals with harvested products and transport of goods out of the facility. The Vertical Farming sector in agriculture is in a nascent state of development. Engagement with entrepreneurs and companies that are positioned to cooperate in the development of commercial models will be critical to ensure the sector takes positive steps forward to encourage the adoption of Vertical Farming by commercial growers across diverse markets. At first, and as with any pioneer period in any industry, things will inevitably be hazy and unclear – Challenges like food safety, advanced technology, novel claims, science, innovation, new architecture and government recognition must all be considered as important components of the global trend. In an industry that is already spurring a new generation of entrepreneurs, Vertical Farming has the potential power to help transform the existing food supply chains by attracting future farmers that can innovate using technology and bold risk taking. We invite you to download the paper in the link below and engage with an array of Vertical Farming stakeholders as we discuss proposals that will influence future development and business models, and promote innovation in agriculture.